Business Data Catalog (BDC) provides SharePoint with an ability to display, choose and store data from such external data sources as Web services and DataBases. Data item from external data source (either a record from a database or an object returned by a Web service) might be called BDC Entity Instance. BDC Column (or BDC Field, they are synonyms) is a column of ‘Business Data’ type. Once BDC Column is added to a list, users will be able to choose a BDC Entity Instance from the BDC to store as the value of the BDC Column. 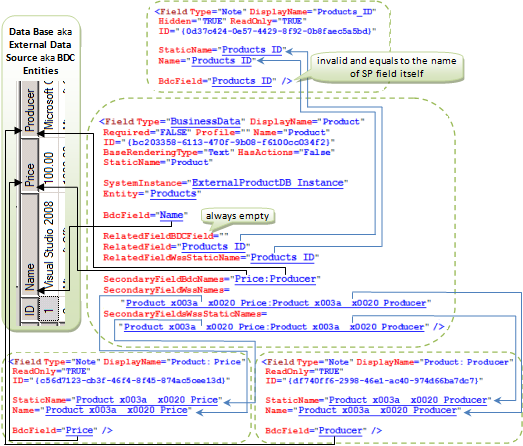 BDC Column can be considered as a complex field, because technically it’s a group of several logically related SP fields. Adding one ‘Business Data’ column to the list, at least two fields will be added to the list in fact. The first is intended to contain a display value that will be shown to the user, while the second is intended to store an encoded identifier of the chosen BDC Entity Instance. <Field Type="Note" DisplayName="Products_ID" Hidden="TRUE" ReadOnly="TRUE"
<Field Type="Note" DisplayName="Product: Price" ReadOnly="TRUE"
<Field Type="Note" DisplayName="Product: Producer" ReadOnly="TRUE"
We have four added SP Fields that are logically related. As I mentioned before, the first field (Name=”Product”) is intended to store a value, which is displayed to the user. Besides, the field contains a number of attributes that refer to all of the rest of logically related fields. We’ll study these attributes a bit later. The second field (Name=”Products_ID”) is a hidden field, which is intended to store an encoded identifier of the BDC Entity Instance. The encoded identifier usually looks like “__dk410035008400140025005400k410…”. It’s permissible if more than one BDC Entity fields compose the identifier. Other two additional fields (Name=”Product_x003a__x0020_Price” and Name=”Product_x003a__x0020_Producer”) are to store and show such properties of the chosen BDC Entity Instance as Price and Producer. These additional fields are optional, you might be unwilling to have any extra information in the list. All of the rest of fields have BdcField-attributes as well. The attribute contains the name of BDC Entity field, the value of which will be stored in corresponding SharePoint field. But I’ve found an exception. This exception is the hidden field, which is intended to store an encoded identifier. In the given case it’s the Products_ID field. The BDCField-attribute of such fields always contains an invalid value, which equals to the name of the field itself. In our case is BdcField=”Products_ID”, and there is no BDC Entity field with the name Products_ID defined either in DataBase or Application Definition File. And the same situation is with all BusinessDate SharePoint fields I investigated. string secondaryFieldWssNames = string.IsNullOrEmpty(secondaryFieldWssNamesVal) ? string secondaryFieldsWssStaticNames = string.IsNullOrEmpty(secondaryFieldsWssStaticNamesVal) ?